Okay, my example looks pretty good. But your kiddos' work will look even more awesome and delightfully hilarious because all of these turn out so unique! 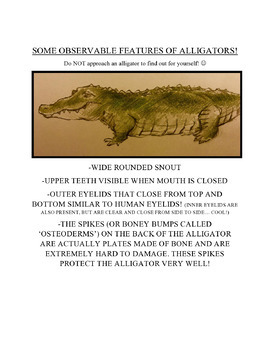 My little artists LOVE this project and it helps them remember their observable features of alligators! Our Kindergarten students study observable features of animals and our 1st grade students study habitats. I do this lesson with our Kindergarten students towards the end of the year. 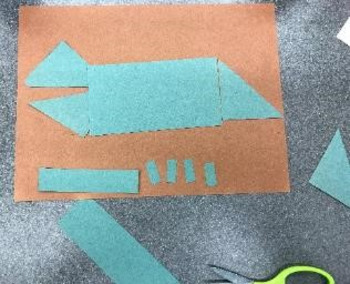 It is a fabulous review of and lesson on creating shapes (math) as well as science (animals + potential habitats) and can even be considered as a simple engineering project (collaging / piecing together shapes to form subject as well as potential folding for a simple ‘3-D’ details). We DO NOT use templates for this lesson; the students cut their own shapes and experience problem-solving even if a mistake is made. This project is certainly a CHALLENGE (for any student Kindergarten through 3rd grade), but I have seen how proud my students are of their individual finished projects and of themselves for accepting this alligator challenge! If there is a special need, I will have pre-cut shapes available, but I usually am able to assist any students who have special needs. Because we do not use templates, students experience the process of creating new shapes out of other shapes and experience a boost in confidence and we all enjoy delightfully unique outcomes! Because I am doing this project with Kindergarten, I do not focus as much on habitat other than a brief discussion and mention of our own Georgia Okefenokee Swamp (they get into habitats in depth in 1st grade), but if habitats are desired, more swamp ‘grasses’ could be added as well as lily pads, mosses, etc. I DO include instructions for creating pre-cut shapes with dimensions and instructions on modifying the lesson with pre-cut shapes. The unlisted Youtube VIDEO link is great for clarification for all of the steps or you could even just play/pause the video for your students to follow along with as I do in my faux-flipped classroom. 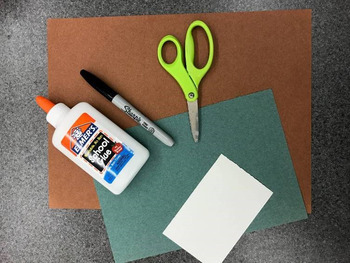 Included in this lesson: Visual Arts Standards (for Kindergarten, 1st and 2nd grades) from www.nationalartsstandards.org, Differentiation Ideas, Grading Rubric, Essential Question, Materials List (basically construction paper, pencils, scissors, black markers and glue! 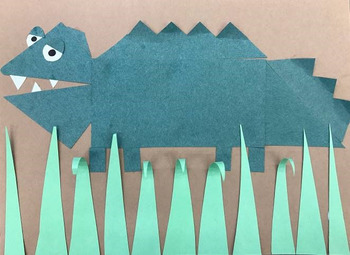 ), Observable Alligator Features Sheet, Detailed Written Instructions, Photo Instructions, Separate Instructions for Pre-Cut Shapes, Video Access (unlisted Youtube video). Have fun with this STEAM / STEM lesson from the art classroom of Claire Dunaway Cyr!